Two leading consultant ophthalmologists presented to GPs and optometrists at Moorfields Private’s latest education event, aimed at providing additional training on eye conditions to help recognise when patients need more specialist care. 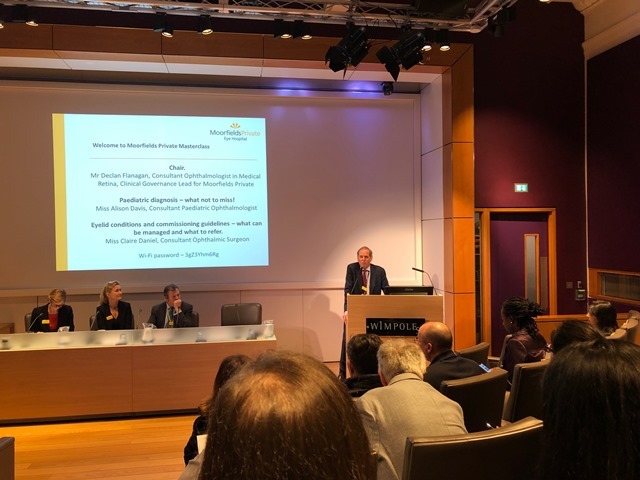 The event was held at the Royal Society of Medicine on Wednesday 20 March and was chaired by Mr Declan Flanagan, consultant ophthalmologist and clinical governance lead at Moorfields Private. Ms Alison Davis, consultant paediatric ophthalmologist, urged everyone to perform a simple test on children to check for the red reflex during her talk on children’s eye conditions. The red reflex test is a non-invasive test that can show early warning signs of serious eye conditions in children and is usually performed by a GP or optometrist. There are some things you can look out for at home, such as an abnormal white, yellow or black reflection in one or both eyes when using a camera flash. Learn more about checking for the red reflex. Alison advised on other complex children’s eye conditions that must not be missed, such as papilloedema which is a rare but potentially life threatening condition if not detected early. “When looking for signs of papilloeadema, it’s important to remember the whole child. Headaches, vomiting, sleep disturbance and behavioural changes are all symptoms to look out for”, said Alison. Ms Claire Daniel, consultant ophthalmic surgeon, also presented at the education event drawing on her ten years’ experience as a consultant in the adnexal service at Moorfields treating conditions that affect the tissues surrounding the eye, including the eye lids, extra-ocular muscles, socket and tear system. Claire used her talk to remind GPs and optometrists to invert the eyelids during examinations to check for foreign bodies and suspicious lumps. Mr Alexander Ionides joined the panel of ophthalmologists for the Q&A session to answer questions on the different implantable lenses that are available for cataract and vision correction procedures. We will soon be posting interviews and recordings of the main presentations. Watch this space for further updates. into Moorfields to support NHS services.